The exhibition brings together works by three artists interrogating the boundaries between fact and fiction, the present and the future; the visible and the invisible in order to reflect upon and present new realities. Osborne Macharia’s photography draws on culture, fiction and narrative to tell afrofuturist narratives that depict transformation. 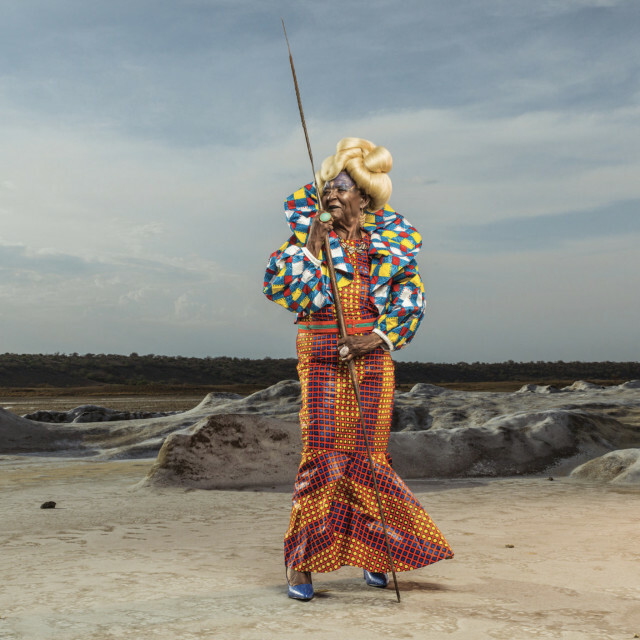 In Magadi, former female circumcisers living in Lake Magadi, have abandoned their former practice and taken up fashion as an alternative livelihood and tool to equip a younger generation of women. Dennis Muraguri’s woodcut prints chronicle matatus, the common mode of public transport in Nairobi. He documents their changing facades, viewing them as metaphorical symbols of the economic and socio-political status of society and as machines with a complex relationship with the governments’ attempts at regulation. The artwork on the matatus reflects (personal and collective) preoccupations and future aspirations, political and ideological affiliations, current affairs and popular global culture. In the Folk Memory series, Ephrem Solomon’s woodcuts highlight the importance of living in the present (and being expectant of the future). He utilizes archival newsprint to reflect on previous political ideologies, providing a potent background for portraits of unidentified individuals to be memorialized. The figures, dressed in black, appear to be in mourning the loss of loved ones and the inevitable passage of time. Made in Africa (2015) reflects on the fraught relationship between power and the people in the 1998-2000 civil war that severed relations between Ethiopia and Eritrea. The archival map featured on the work shows the countries before this took place, echoing the current political restoration taking place between the two countries.